For me, taking a stroll down Memory Lane means digging through boxes of old photos. Determining the date the photo was taken is easy as most of them have the date printed on the white border around the picture. The coloring of the photos are a bit off, some photos are bent, others have a sticky backside from being pulled out of an album. Then I have my own children’s photos to stroll through. My first born’s photos are similar to mine being in boxes or albums, the color and clarity much richer than the old photos from the 70’s. But when I search for my third born’s photos, well that is a whole new story. Her photos are all on my computer. All digital. Instead of being piles in a box, her photos are “piles” of digital photos in a folder on my desktop. Some are organized by dated folders, but not many – that is a job for another day. Realizing that this is how most people store their photos, I wanted to teach my students a way they could bring their memories to life. This is the third year we are creating a digital memory book. Each year, it gets better and better! This project takes about 5 months to complete and a lot of the work happens at home, on the student’s own time. By the end of fifth grade, our students will have a digital memory book that spans from birth to the end of fifth grade. It is a keepsake that I think most parents will treasure for many years to come. Each month, students are assigned a specific time period of their life. They are asked to come to class by a specific date with photos from that time period on their iPads. This letter is sent home each month to parents to make sure students are prepared on the date we have set aside to work on the books. Along with the letter is the organization sheet the students fill out for each photo selected. Each time period should last about a minute with the whole memory book lasting about 7 minutes long. When “books” are completed, we have a gallery walk and allow time for others to view the books. The final step is transferring the memory books onto a flash drive for the students to take home and be able to treasure their elementary years for many years to come. Now that…Is Positively Techie ! The end of the school year means a time to reflect, a time to think about the next little family of students that will be coming my way in the fall. What worked, what didn’t, what I can do better, what I will try new next year? The questions, thoughts, and ideas keep swirling in my head. As much as I don’t want this year to end, I can’t help but think about how I can be a better teacher, learner, facilitator, and leader next year. The biggest change for me this school year was turning my classroom into a flexible learning space. It by far was THE BEST idea I had all year! The positive response from the parents, students, and other staff members was overwhelming. The students tell me how much easier it is for them to learn in my classroom because “they don’t feel confined”, “they are comfortable”, “they can focus on their learning and not on the fact that they are sitting where they don’t want to sit”. The thing about my classroom is it’s not only about the furniture. “Flexible” was more of our motto all year. WE were flexible. Students had the choice of where to sit any time of day. They had to make the right choice everyday to ensure they got their work done. To my amazement, the majority of the time, they made perfect choices for themselves! I gave them the power to take some control of their learning and they used their power wisely. Next year, I already have plans to make a few changes and add a few fun pieces of furniture (and hopefully ditch my desk – if I can find it a new home). I was able to teach all the fifth graders during a designated “tech time”. I worked with students on projects dedicated to Social Studies, Science, and Language Arts as well as a few techie lessons to build their technology tool kit. We had Mystery Skypes, wrote blogs, and worked on many projects including a few of my favorites the “Shark Tank” project, a Mother’s Day video, and a digital memory book. Our local Apple Store in Oak Brook, IL. sent out two members of their Creative Team to lead workshops to teach the students about the Apple apps on their iPads. The team came out several times throughout the school year and helped the students create a digital memory book. This “book” is a memoir of their life from birth through fifth grade. It includes photos, video, student created background music, and a voice over of the students telling their stories and memories for each year of their life. These are truly going to be memorable keepsakes for years to come! Towards the end of the year I started an Innovation Club and began the creation of the weCreate Lab at our school. I met with K-2 graders and 3-4 graders to introduce them to technology tools that will be available to them next year in the weCreate Lab. My favorite item is the ozobot robots. I LOVE how ANYONE who can draw a line can make the robot move from one place to another. I am also loving the fact that students build on their expertise and eventually code on the computer to lead their robot from one place to the next. I spent a few sessions with Snap Circuits and littleBits. The students easily caught on and understood how everyday items get their power through circuits. I gave students challenges to make the light dim, make the fan turn on, and turn a light different colors. It was rewarding to see how the students, even Kindergartners, kept trying and didn’t give up until they figured it out. The excitement and joy they showed when they finally met the challenge was awesome! The last couple of sessions we will be exploring the Makey Makey Kits. Students this year got a taste of the new technology tools available to them, but next year, we will really be able to dig in and go through the whole design thinking process. Subscribe to John Spencer on You Tube! I want my students to be risk takers, therefore I hold myself to that same standard. Each year I try new things. Either I expand on what I’m already doing or I try something completely new. A couple of new ideas didn’t work out quite as I planned. This year I tried The Global Read Aloud for the first time. The Global Read Aloud is a global phenomenon created by the amazing Pernille Ripp @pernilleripp. Books are chosen each year and classrooms around the globe read the same book and connect to discuss the book through Edmodo, blogging, Skype, etc. I set up 2 classes for my class to connect with and we actually did connect with one class. It was not easy to get all of the assigned chapters read each week and the class that we actually did connect with didn’t participate much. I love the idea behind The Global Read Aloud, but I also feel that in order for it to work both classes need to really commit to participating fully. Next year I want to improve on so many things. I want to schedule more Mystery Skypes. After the first Mystery Skype I ever did, I never wanted to give another map worksheet. The amount of authentic geography learning that happens during a Mystery Skype is astounding! Everything I know and have used on Mystery Skype I got from another amazing educator Paul Solarz @PaulSolarz. I planned on participating in blogging challenges with my students, but I didn’t. That will definitely be on my goal sheet for next year. I also want to learn and use Google Classroom to it’s fullest potential. It was a helpful tool to send out and collect assignments however I know it could be used for so much more! I follow Alice Keeler on Twitter @alicekeeler. She is THE ONE to turn to if you want to know anything Google. 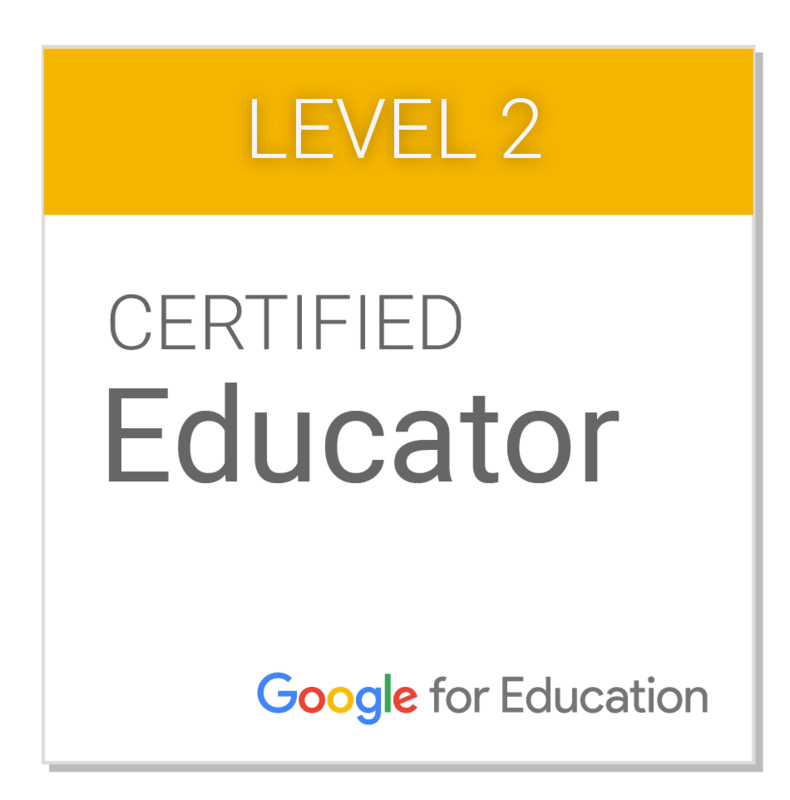 I will be researching all things Google as well as work on getting my Google Certified Educator Levels 1 and 2 this summer. Of course I have some new things up my sleeve that I can’t wait to try next year. I am super excited for Breakout EDU to arrive. This is a game that promotes collaboration, teamwork, problem solving, the list goes on. The goal is to unlock the box in a specific amount of time. There are several different scenarios with clues to a mystery that needs to be solved. You work together to solve the mysteries and unlock the box. I want to start the year off with a Breakout EDU game at one of our Institute Days. This way, the staff can see first hand how students can build bonds through the collaboration and teamwork involved in opening the box. A PERFECT back to school activity!! I am looking forward to connecting Common Core State Standards and Next Generation Science Standards to activities in the weCreate Lab and designing some novel engineering activities. I also signed up to receive the Idea Box from the James Dyson Foundation. I am excited to learn more about Hyperdocs and create some for the upcoming school year. I want to tip my toe into gamification and figure out what it is all about. I am sure there are things I don’t even know I want to learn about. The summer days are a great time to learn more about amazing ways to integrate technology into the classroom. How are YOU growing as an educator this summer? Is there something you want to learn more about? I am looking forward to spending time with my “real” family, sleeping a little bit later in the morning, lounging by the pool, and going for long, quiet walks. But I will also be thinking, designing, creating, learning, and doing everything I can to be…well – better. Now that… Is Positively Techie! Two classes chose to mass produce and sell their product, one class chose to market all three products. The students spent the next few weeks working in groups making the product, packaging the product, creating commercials, jingles, and websites. The inventor was the “boss” and was in charge of their “employees”. The “boss” had to make a lot of decisions and answer many, many questions. It was interesting to see how each student fell into their role and took their job seriously. I can honestly say I am super proud of my fifth graders! Once all products were made and packaged, we sold the items during lunch to raise money for our weCreate Lab at our school. We made A LOT of money and now the fifth graders get to decide what materials to buy for our weCreate Lab. We will be making that decision next week. My students now believe that their ideas matter, that they DO have a voice that can be heard. My students now believe in themselves and have a sense of pride for their hard work. They also have a feeling of accomplishment and ownership for real life solutions. That is all I could ever want as a teacher. What did you learn form this project? My goal is to continue working towards giving my students opportunities to be risk takers, use their creativity, follow their curiosities, and share their voices to the world. The weCreate Lab at my school is the perfect place where students can use a variety of materials to do just that! “Shark Tank” Classroom Materials for you to use (simply duplicate the copy and modify to meet your needs)!